Where Attitudes are Nourished and Being a MisFiT is Just Part of the Day!! Why, Oh Why, Does "The City" Exist? 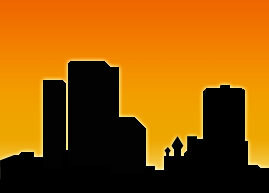 MisFiT City Forum, sometimes called "The City", "The Forum", or "MCF", is an eclectic soap box of multi-topic converstions which can range from the mundane to the down-right gripping issues affecting the world. Even though the pursuit of peace, unity, and brotherhood are on the rise, we are still confronted with hate, disharmony, coruption, and ignorance. And the number one way to fight the good fight is to talk about it!! That's right!! We think out of the box here at MCF by standing on it, not cowering inside of one. We encourage people to express their innermost MisFiT without having to apologize to anyone. Rather than relying on others to fill our heads with non-thinking sheeple material, we break the mold of yesterday - oh, to hell with it - of centuries ago. Mind you... this Forum is not for everyone. This Forum is for those people who recognize they are different, that they are, in fact, a MisFiT. This Forum is for people who want a safe place to converse with others of their own mentality. People who feel free to ask questions, share concerns and ideas, and give answers. Being a member requires reading. Reading promotes research. Research produces knowledge. And, knowledge creates inteligence. For those individuals equipped with the prerequisite of "converstion", the gift of gab, the ability to muster a paragragh using sentences with nouns, verbs, adjectives, adverbs, subjects, and predicates, we want to met you ASAP!! My friend, your jounrey to joining The City is one click away!! Anyone (with the exception of spammers) can join The Forum. Everyone who joins can share their thoughts on The City and if they don't turn out to be nefarious spammers, can stay and frolic and be joyous in their MisFiTedness like us. What is a MisFiT, you ask? By definition, a misfit is "a person whose behavior or attitude sets them apart from others in an uncomfortably conspicuous way." To expound on this, a MisFiT is someone who does what is right. It may not fit another person's ideas or beleifs, but the act was rightous. The world has been aware of MisFiTs throughtout history, such as Albert Einstein, Abraham Lincoln, and Ernest Hemingway. Oh this is easy! 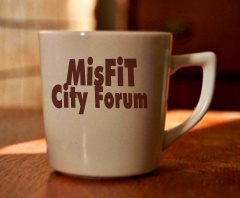 Post 20 new and unrelated topics on The City and get yourself a MisFIT City Forum Coffee Cup. I told you it was easy!! Go to the MCF Coffee Cup discussion and see for yourself. What is it? Occupy Wall Street has been a recognizable force since September 17, 2011. They have been sending a message to the peoples of the world expressing their oppostion to the current inequalities of income plaguing the United States and the world. They are looking for representation for the 99% of Americans who have been overlooked by the people in political office. The preponderance of people who have been sucked into the corportate vortex have been taken advanatage of and are taking advantage of the working class and poor. They are protesting that the differences between the "haves" and the the "have nots" have to change. They represent the 99% of the people of the United States 100% of the time. They are sending a message to the peoples of the world. Why do we support OWS? Because they are MisFiTs in the truest sense of the word. MisFiT City Forum consists of many topics ranging from the Ramblings of a MisFiT by Mick, aka "misfitguy", to the Current Issues which circumference our entire plant, like world peace, politics, and religion. The MisFiT City Forum is the most unlimited open discussion community consisting of people we have met during our travels across the nation selling our own line of sunglasses and goggles to various people (mostly motorcycle riders) and people we have met on the internet. We hope to find other MisFiTs like us to join the MisFiT Community and partake in sharing their own MisFiTedness with the rest of the world. Mick has his own soap box section. Find the topic that interests you and add your own opinion. Go ahead! I dare ya to try to change his mind. General MisFiT banter goes on here. Laugh your buns off in this room!! There are a lot of Events out there. Just another place to add your event or events that have turned your crank. General talk of foods goes on here. Mick and I have touched on some issues like diet, diabetes, fitness, green tea, why not to eat beef. There is room for more discussion. I am allergic to MSG (monosodium glutamate) and I have dedicated this room to talk about the harmfulness of the dangerous flavor enhancer. I have a website which is a help source of information. Share your recipes and read others. Get ideas for breakfast, lunch, and dinner. I am a lover of photography having a D-SLR myself and some other carmera models. Share your photos or your appreciation for your favorite artist(s). Some of us MisFiTs write poetry and short stories. Share your creates here. This is a serious group of researchers. Feel free to share your encounters and your questions. Get down to nature and camp with us. Do you use dynamite too? Sometimes my husband uses worms, and it's embarrassing. Gun or Bow... Let us know. I am partial to my Olympus E-510, but I have no problem using my Ithaca on those tough bastards. Mick and I are Baha'is. As Bahai's, we are open to discussing the truths of religion. We have had many meaningful talks with people of many different religions. We love diversity. And we love to talk to other people that love diversity. If you have questions about about the various aspects of religion, please share. This room has been inspired by one of the principles of the Baha'i Faith. Anytime there is a topic that discusses unity, you will find it here. It is envitiable. We will have world peace. Some people are not so sure. The world and the universe is a wonderful place. Yuck!! We discuss the horrors of this most disunifying city block - the ghetto of our city. We talk about the double speak of our politicians and the minute breaks in the storm that we and all the world need more of. Everyone reads the News and sometimes we see things that make us smile or make us frown. This city block is our news room. Who are you? Who are all these MisFiTs? Be welcomed and welcome others. Do you read? What do you read? Interested in finding other favorites? Share yours. Mick and I have a Mountain Treeing Feist. Her name is Cricket and you may have seen her in one of the shows we sell our sunglasses. We also have a cat. Share your furry friends here. Surf the internet with these favorite links. Internet games are cool!! Share your favorites here. Every forum has issues it wishes to share with its members. This is no different. Become a member of The City today! If you are interested in becoming a member of the MisFiT Team, join MCF and private message me (admin). Thank you for your interest.